Kembu is a Japanese martial art that combines sword play with dance. At the Samurai Kembu Theater in Kyoto you can watch a performance of this traditional dance and enter the world of the samurai warrior. Our flashing blade, Michael Lambe, reports. 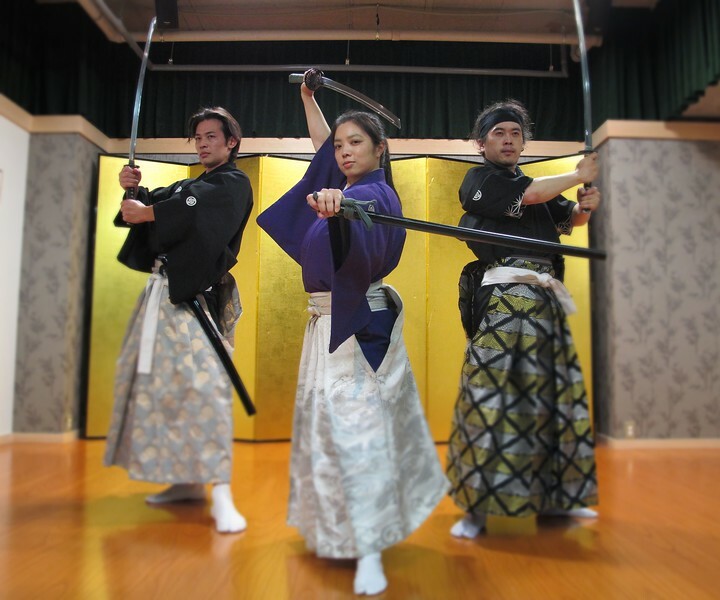 There is a small theater in the heart of Kyoto’s city center, where you can experience first-hand the Japanese way of the sword. The place is called Samurai Kembu Theater and they put on shows and give lessons daily. When I was asked to visit them on behalf of Inside Kyoto, I jumped at the chance. What could be more fun than dressing up like a samurai warrior and waving a sword around? I wasn’t disappointed. The experience was both enjoyable and very educational. Escaping from the sweltering heat of high summer in Kyoto, I sank with relief into my seat in the air conditioned Samurai Kembu Theater. I was about to watch an hour-long samurai show and was looking forward to some swashbuckling swordfights. What I didn’t know was that kembu is as much a dance as it is a martial art, and so is always accompanied by traditional music and poetry. Individually or in pairs the dancers performed for us beautifully choreographed set pieces. Gracefully they stepped and stamped, twirled and thrust; their swinging swords whistling through the air. I was captivated. What made the experience especially worthwhile, was that the dances were set in context. Between performances, we were told about the history of the samurai, a class of noble warriors for whom the sword was not merely a tool for fighting, but a sacred object and a symbol of their responsibility and dignity. Each dance too was explained to us. Each of the poems that accompanied the dances told a story, of a hero’s tragic defeat for example, or a battle between two rivals. In the elegant movements of the dance, the performers were acting out those stories. 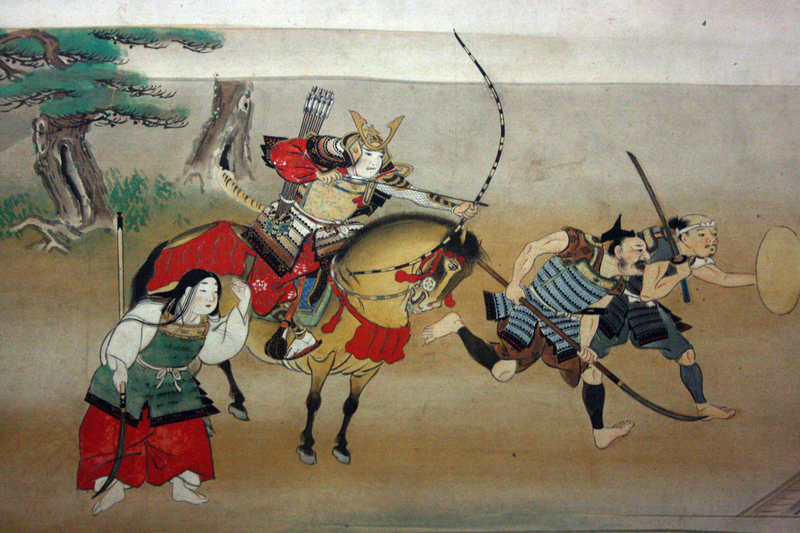 The samurai were Japan’s military nobility between the 12th and 19th centuries. Their lives were ruled by a strict code of ethics and a deep sense of duty. For hundreds of years samurai warriors would practice choreographed moves just like the ones I was watching to improve their technical skills. This was called kembu (剣舞) which literally means “sword dance”. It is said that samurai would perform dances like this before a battle in order to raise their spirits and improve their concentration. The samurai class was disbanded when Japan entered the modern world in the late 19th century. However, some former samurai preserved their skills and made a new livelihood by giving swordplay performances. Kembu dances, accompanied by songs that told stirring tales of battle, or sentimental tales of parting and loss, were a popular part of their repertoire. Today at Samurai Kembu Theater, the followers of this tradition, are keeping the samurai spirit alive and teaching a new generation the discipline of swordsmanship, and the dignity of the dance. Included in the show we watched were some fan dances. There have been times in the past when swords were outlawed in Japan. During such times, kembu practitioners adapted their dances to use fans instead of blades. These fan dances were very beautiful, and were retained as part of the kembu repertoire even after swords were made legal again. We were shown some typical ways in which the fan is used in the dance to help to tell a story. Raised to the lips, it becomes a sake cup, fluttering down it becomes the rain, twirling it is falling leaves, and undulating it is the snow. I wondered why the performers sometimes hopped on one foot during dances and it turns out that that gesture denotes a warrior riding a horse! Watching a fan dance by master Kembu practitioner, Auga Magari, I was mesmerized by her perfectly measured steps as she depicted a warrior riding to battle through falling cherry blossoms. In a neat piece of sleight of hand she suddenly switched a white fan for a crimson one that represented the blood of falling warriors. 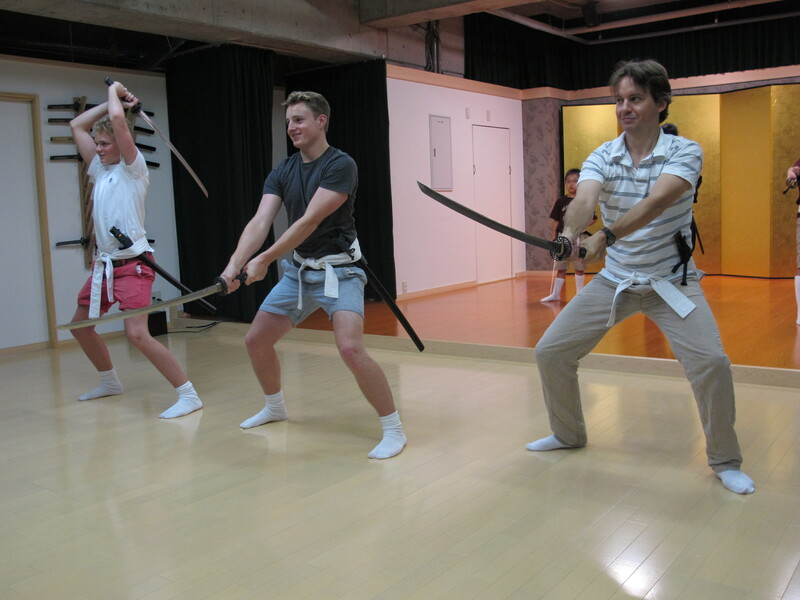 After the show I took a lesson in basic sword moves and etiquette along with a couple of excited British boys. It wasn’t easy for us to emulate the smooth moves of the performers, but it was a lot of fun, and surprisingly good exercise too. The samurai of old must have had excellent posture and very strong calf muscles! After we had learned the basics we got to dress up in some real samurai gear and strut our stuff as the staff obligingly took our pictures. There are various programs and combinations of show and lesson that you can follow. If you are parent with children, you can simply opt to watch your kids having fun. 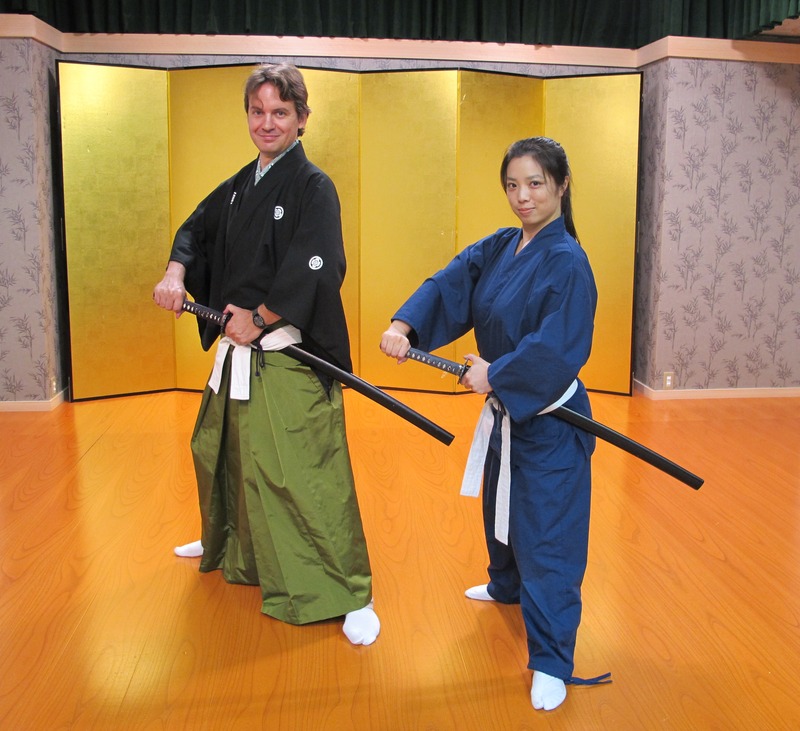 I chose a light program, of a one hour sword lesson, and the option to dress up in costume afterwards. Longer programs involve more detailed dance steps including fan dancing. 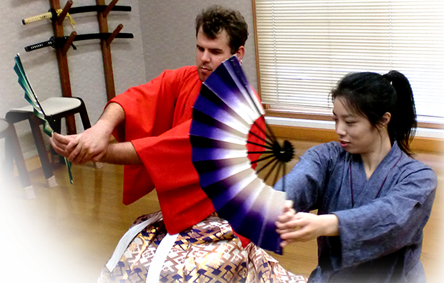 If you are really keen and plan to stay longer in Kyoto, you can also attend a two week intensive course and become a true student of this remarkable martial art. Check the Samurai Kembu website for details. 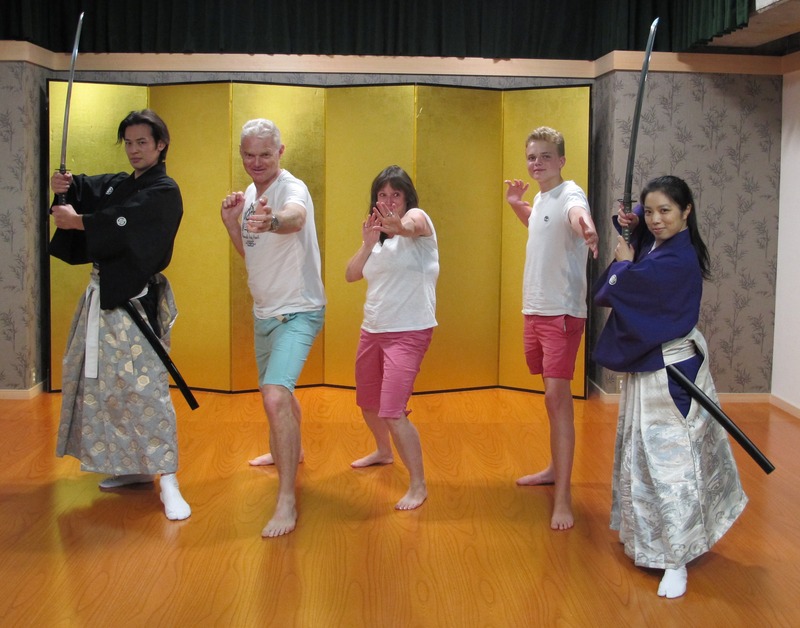 Obviously this is a great activity for families with children, but no matter what your age or gender is, taking in a show and a lesson at Samurai Kembu is a wonderful way to spend a couple of hours when visiting Kyoto. The staff all speak English, and the explanations and instructions are very clear. The Donald family from England, who attended at the same time as me, were all very happy with their experience. Their boys, Rory and Will, spoke of it enthusiastically as “great fun” and “majestic,” and their mother Alison, praised it for its accessibility and the insights that the experience gave them into Japanese culture. She also pointed out what a great activity it is when the weather takes a turn for the worse, because you can still do something active in the air-conditioned shelter of the theater, rather than retiring to a museum or your hotel room for a siesta. And once you start learning those samurai moves, you really are continuing a living legacy. Master Auga Magari, who opened the Kyoto Samurai Kembu Theater in April of 2014, learned her first samurai dance steps from her grandmother when she was just 2 years old. And her grandmother, who continues to dance well into her 90s, is from an old samurai family. I think it is worth the entry fee just to see that proud legacy continued in Master Auga’s charismatic dance. 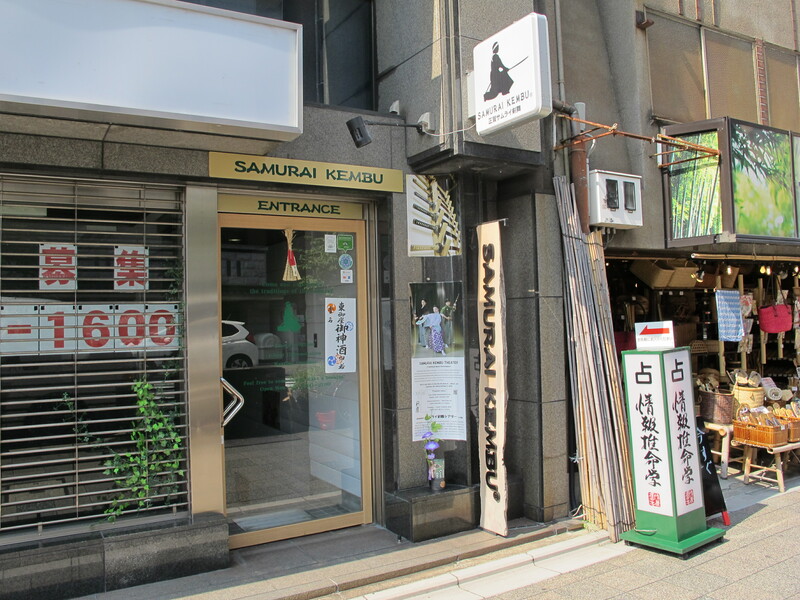 Samurai Kembu Theater is very centrally located on the north side of Sanjo Street, just a short walk east of Sanjo Station. Check their website for a map. Prices range from 3000 yen for just the show, 8000 yen for a show with a one hour lesson, to 10,000 yen for a show with a two hour lesson. Discounts are available for children. Check the website for further details. 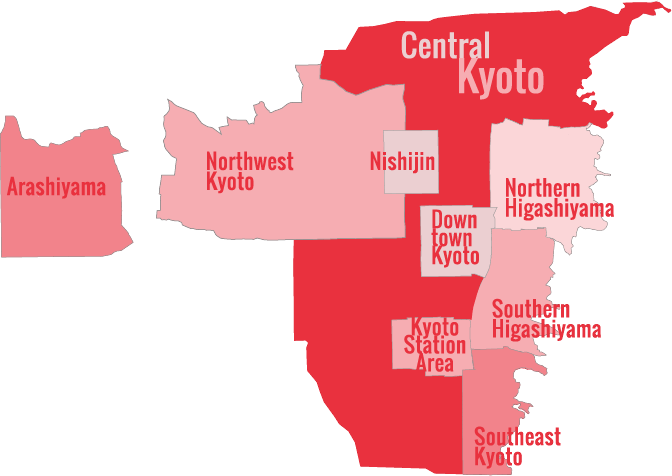 If you’re interested in learning more about samurai and their dramatic history within Kyoto, see our Kyoto Samurai page.